After 6 months of gallivanting about the globe (racking up well over 60,000 flight miles and sleeping in over 22 different places in that span of time), I've finally settled down in Busan, South Korea for this season. I've been crazy-blessed, getting to see so much of the world (thought my passport pages weren't going to last me! ), but I have to say I am blessed once again to stay put now for a while. As I try to recover from the whirlwind of 2012, I'm slowly finding energies again to do non-survival-activities, like cooking and photographing. Sadly my DSLR is back in California, being well-cared for by my parents, so I'm back to just point-and-shoot photography again. And, all my lovely dishes, linens, and tableware is also back home, packed up in storage, which does put a damper on my food photography. Sigh. But the culinary landscape has been absolutely a dream here in Korea!! One of these days I'll have to get my DSLR back again and start trying to do justice to all I encounter. I feel like I'm eating constantly, with the best banchan, tastiest stews, and delightful Euro-Korean baked goods everywhere. I'm doing my best to learn about what I am eating on a daily basis, and I'm hoping that one day I'll know these awesome dishes well enough to make them all myself. Taking things one at a time, I decided to recreate a tasty side dish (banchan) that I had for lunch a couple weeks ago. It's a bit like a salad of sorts, a mix of sauteed squid and fresh vegetables all tossed in an amazing spicy and tangy red pepper paste dressing, with the fragrance of roasted sesame and the fresh perilla leaves. I loved it just the way I've written the recipe below, but next time I might add more perilla leaves and perhaps use one more squid, or add in some other type of seafood for a medley of textures. But back to this particular version, here's what you'll need: Green cabbage, Swiss chard, fresh perilla (wild sesame) leaves, fresh squid, rice vinegar, roasted sesame oil, soy sauce, sesame seeds, Korean red pepper paste (gochujang), and sugar (forgot that in the photo!). Not having my trusty Trader Joe's nearby to sell me pre-cleaned and pre-cut squid, I entered into new territory and cleaned squid myself for the first time! Turns out it's pretty easy and fun to do, so if you ever want to get some fresh squid, don't be intimidated, just go for it! 3. Find the beak, and then cut it from the tentacles and discard it. 4. Grab the mantle (large portion on the left in the photos) firmly with one hand and then with your other hand grab the head (region with the eyes) and pull the "guts" out of the mantle. Discard the eyes and the attached guts. 5. Find the end of stiff quill within the mantle and pull it out. At this point, if you find there is any "gloop" still inside the mantle, scoop it out with a spoon. Briefly rinse the squid, if necessary. 6. Finally, slice the squid as desired (I cut the mantle twice, lengthwise, then cut crosswise for a very coarse "julienne"). This kind of Korean side dish is called a "muchim" (pronounced moo-chim), which refers to anything that gets seasoned with this tangy red pepper paste dressing. I find it pretty addictive, and the great thing is, this kind of food is super healthy so everyone has permission to indulge! 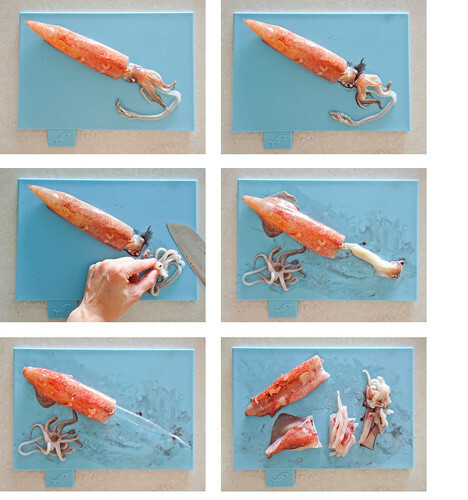 Clean the squid and cut into small strips (about 1 ½ inches long). Heat a little sesame oil a non-stick skillet over medium-high heat and stir fry the squid until opaque and just cooked through, about 1 minute. 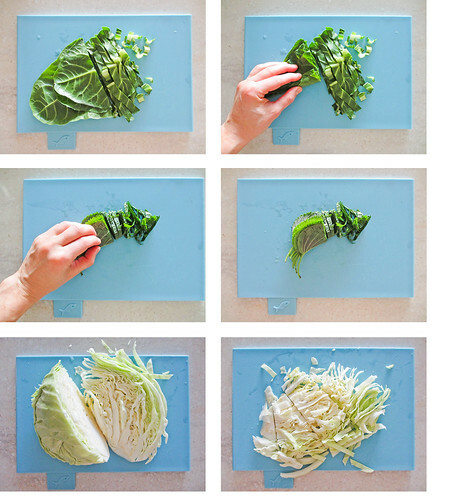 Place the Swiss chard, perilla leaves, cabbage, and squid in a large work bowl, then add the seasoning ingredients on top. With a gloved hand, mix until all ingredients are thoroughly combined and everything is coated evenly with the seasoning mixture. 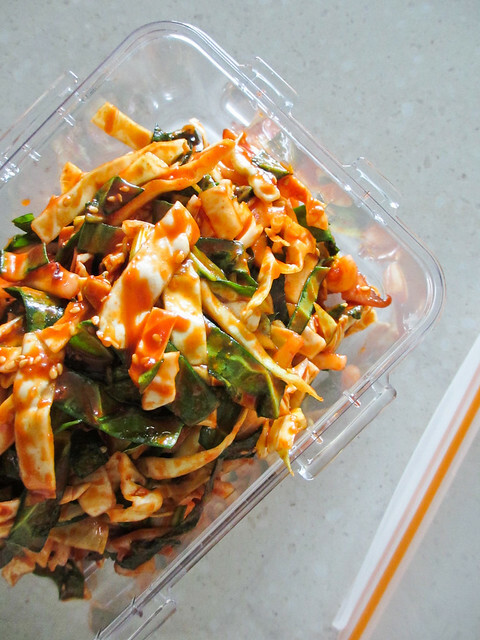 Serve as a side dish for a traditional Korean meal at home or in your dosirak (lunch box)! 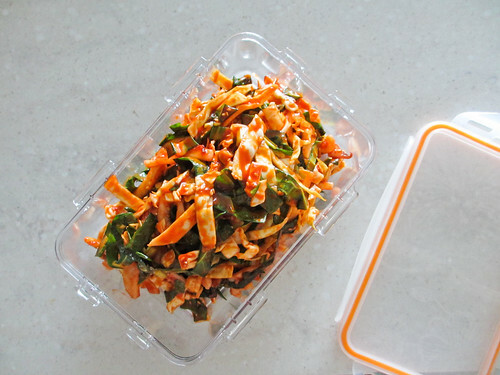 Store any leftovers in an airtight container, refrigerated. What an interesting dish! I have always been curious about how one deals with fresh squid ... pardon me as I bookmark this little tutorial, as I would love to try several squid dishes and dealing with a fresh one would make things even better! Am wondering if a thai chili garlic sauce might be used instead of the Korean red pepper paste ... ??? or a scirachi sauce ??? I was craving for spicy stir-fried squid today and thinking that I should make it soon, then here it is. You have done a great job. Yummy! Hi Erica - It's been a while, but I'm so happy to hear you're traveling around the world and seeing so much! Nice that you're settled down in Busan for a while. I visited Busan quite a bit growing up. We had relatives living there. I also visited there again a few years ago with my son. Love the city! Your sweet and sour ojingeo muchim makes my mouth water, and this is only 8 in the morning. I haven't had my coffee yet on my day off. Anyway, hope you enjoy everything Busan has to offer. This muchim dish looks delicious. Thanks for the squid-cleaning tutorial! Just came across your blog by way of your review of the B'stillas recipe on epicurious.com. Do you still have the picture of that on your website somewhere? 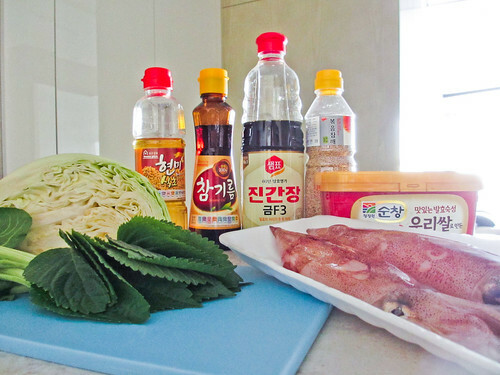 Also, have you come across a really good japchae recipe, yet? It never seems to taste right when I make it.